October 2014 — It started last October, when I first felt some odd little twinges in my left breast. No big deal, I thought. I’m 72. New aches and pains are to be expected. Sometimes they were sharp enough to make me wince, but I still didn’t think enough of it to mention it to my doctor when I went in for my semi-annual “well baby” check-up that month. And my annual mammogram the same week was negative. Nothing unusual or abnormal. I was good to go for another year. Anyway, along came the holiday season. Busy, busy. Still had those obnoxious twinges several times a day. And sometimes a bit of an ache, kind of like a bruise. It all seemed to come from the same general area — the inner third of the breast, near the sternum. Occasionally I thought about calling the doctor, but I was busy, it was winter, the doctor was 25 miles away, etc. And besides, lots of reputable websites seemed to agree that breast pain is seldom from cancer. All kinds of other causes, but seldom a malignancy. And everything looked normal — no redness, dimpling, discharge, etc. Aspirin seemed to help sometimes, so I carried on. Denial. Laziness. Rationalization. Arrogance. Probably some of each. By February or thereabouts, the twinges seemed to be abating, so I decided waiting another month or two, to my next regular check-up in April, would be fine. Thursday, April 9 — Saw my primary care physician and told her about the twinges. Her exam found nothing and she said it was likely fibrocystic disease. But she suggested I schedule an ultrasound, just in case. No biggie, I thought. I’d had a cyst in that breast 30 or 40 years ago that was confirmed with ultrasound, so I knew the routine. Friday, April 17 — Went in for my ultrasound. I thought at the time that the sonographer was taking quite a long time. She spent a lot of time looking at the area I mentioned, and also ran the wand up into my armpit. Logical, I thought. That’s where the lymph nodes are. She’s being thorough. I was a little disappointed that her screen was positioned where I couldn’t see it. After I got dressed, however, the chief radiologist came in. He was calm and very noncommittal when he said he’d like to do a biopsy just to be sure of what he was seeing. My heart skipped a beat … or 10. Okay, I thought, this could be getting serious. Anyway, it wasn’t that bad. The first needle was quick and no worse than any other shot I’ve had. An assistant used ultrasound to show the doctor exactly where his needle and the tumor were located. I didn’t feel the biopsy needle at all and only heard a little snap when each tissue sample was taken. The doctor warned me each time so the sound wouldn’t startle me. The last thing the doctor did was put in a “clip” or a sort of marker that would show exactly where he’d taken his tissue samples. Then I was sent down the hall for a mammogram to get a picture of the clip’s location. But, surprise, they couldn’t get an image that showed it. The tumor is right against the chest wall and breastbone where it can’t be seen on a mammogram. No wonder it hadn’t shown up last October. Even when its exact location is known, they can’t see it on a mammogram. Objectively, clinically, it was an interesting experience. I walked out with only a band-aid on my chest to show for it. But emotionally … I was now waiting for a pathology report that would tell me whether or not I had cancer. It was surreal. In a most unpleasant sort of way. Thursday, April 23 — The phone rang and Caller ID said it was my primary care doctor. My heart was racing even before she said the tests were positive for grade 3 invasive ductal carcinoma and I needed to make an appointment with the surgeon, Dr. So-and-So, to discuss the pathology report and proposed treatment. I begged her for some Valium; it’s in my chart, my previous doctor gave me a couple of tablets for a dental visit, and I knew from years of experience that it works well for me. Was not happy to get to the pharmacy later and discover she’d prescribed Ativan .5 mg, a dose equivalent to half the 5 mg Valium I’d gotten before from her predecessor. Years ago, through trial and error, I’d determined that Valium works best for me and Ativan hardly works at all. So in addition to my extreme anxiety, my confidence in my pharmaceutical crutch took a big hit. Friday, April 24 — Got a chest x-ray that the surgeon wanted … to give him some idea of whether there was anything going on other than in the one breast. Goodie. Just what I wanted to hear, that there might be something going on elsewhere in my chest. So there I was, with almost three full days of waiting until I could see the surgeon at 4 pm on Monday, the 27th, and find out what the hell “grade 3 invasive ductal carcinoma” is. When that’s all you know, the internet is almost worse than useless. The name alone is terrifying. Imagine knowing for three days that you have “invasive” cancer but having absolutely no idea how bad it is, whether “invasive” means it has already spread or just has the potential to spread, what the treatment might be, etc. Now multiply that by 10 and you’ve got the picture. Note – Oct. 9, 2015: I came across a comment in a medical report recently that said if a malignancy has invaded a muscle, it will cause pain. My cancer had invaded the underlying chest muscle, so the twinges I felt were likely from the muscle, not the breast. Wow, chica, what a nerve-wracking experience. I probably would have gone through a two bottles of wine, six movies, and an entire series like MadMen or Boardwalk Empire or something in those three days. I’m glad you’re chronicling this, and hope it’s helping you organize your thoughts and plan of action. Writing the blog back when I had my endo surgeries really helped me. If I’d had any booze in the house, it would probably be gone now. But it’s contraindicated with so many of my meds that it just isn’t worth keeping around. During those three days, the best few hours of complete distraction I had were watching “Taken.” Vicariously killing all those bad guys was cathartic. Spent a lot more time setting up this blog. It’s a bit frustrating that I can’t get these posts caught up with actual events, but I’ve been so busy scheduling, thinking about, and doing things that writing about them just has to wait. Nice to know your writing about your experience was helpful. That will encourage me to stick with this. Thanks, Mak. I know you’re always in my corner, even if we don’t speak of it that often. As for this particular health issue, as with most of the big ones, I don’t expect anyone to know much about it unless they’ve had direct experience with it. I didn’t know much more than anyone else about this until about two weeks ago. I would advise confidence in the medical system because this sort of thing has been a subject of a lot of work in the past decades. I was diagnosed with prostate cancer in 2007. I had radiation treatments for a few months and it went away. I get a PSA screening test every 6 months. Hang in there, PT. I will. After all, this road I’m on now is a narrow, one-way track. The only way to go is forward. The treatment options are mind-bogglingly numerous, which is reassuring until you get down to two different medical centers suggesting two different approaches and you have to decide which way to go. That’s about where I am now. My posts just aren’t that up-to-date yet. Great to hear your treatment went so well. And yes, I have tremendous confidence in medical professionals. After all, my daddy was a doctor and he could do anything! Biopsies – Needles – ugh! (shiver…I hate them) For some reason this blog isn’t coking up in email or reader, so I’m behind – but been thinking of you. 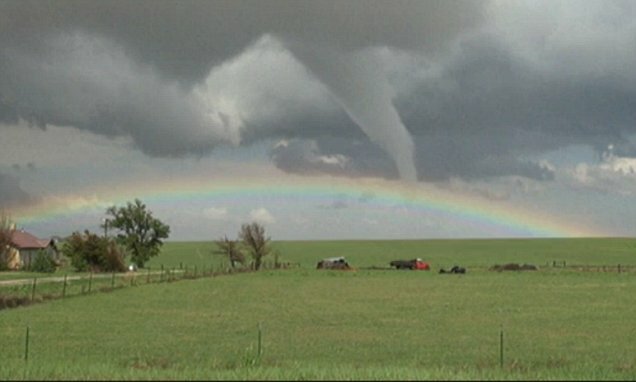 That picture of a rainbow in CO with the tornado center stage right in front. Just seemed like your life right now. Hugs and paw waves! You ever been out around Eads or Lamar? Storm chasing is what they do for fun there. In another life, I might have been a chaser. Seriously. And I love your poetic soul, thinking about me and this picture. Hugs!